Potential awarded CMI Management Gold Award at the British Library. 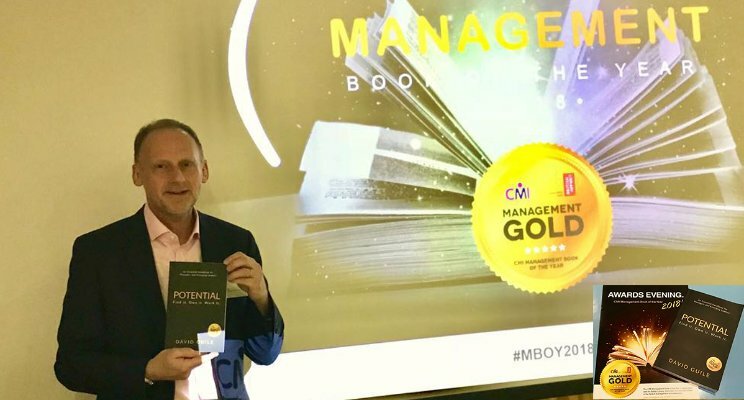 It was less than a year ago that I published my book Potential and last night I was privileged to attend the CMI Management Book of the Year Awards 2018 at The British Library. Potential was shortlisted for the’ New Manager’ Award and although not the overall winner on the night I am delighted to announce that it has been awarded CMI Management Gold status. I wrote the book to share my experiences to support the personal development of emerging Managers and Leaders and to act as a ‘business card’ for my leadership coaching and at the time I never would have imagined that it would take on a life of its own. It became a #1 Amazon bestseller, provided the foundation for a successful leadership conference, introduced me to new clients and has now been adapted into an online development programme. Whilst I was apprehensive about stepping outside of my comfort zone to explore new opportunities and doubted my ability to publish a book that anyone would want to buy, my story proves that we are capable of much more than we think and that it is our self-limiting beliefs that can sometimes hold us back. Embrace new opportunities with confidence and self-belief as you will never know what you are capable of achieving unless you try. You may well be surprised just as I was! I would like to thank everyone who has supported me during this time and I look forward to an exciting 2018. David Guile is an Executive Leadership Coach. Having worked his way up through all the managerial levels within the hospitality industry to CEO, he combines hard-won experience with a robust coaching methodology to provide insights, support, and direction to help emerging leaders find, own and work their potential and the potential of others. Click here to buy David Guile’s Amazon #1 bestseller ‘Potential’. Vision & Values – Do they mean anything to you?